For other uses, see Murex (disambiguation). Murex is a genus of medium to large sized predatory tropical sea snails. These are carnivorous marine gastropod molluscs in the family Muricidae, commonly called "murexes" or "rock snails". The common name murex is still used for a large number of species in the family Muricidae which were originally given the Latin generic name Murex in the past, but have more recently been regrouped into different newer genera. This genus is known in the fossil records from the Cretaceous to the Quaternary (age range: from 125.45 to 0.0 million years ago). Fossils of species within this genus have been found all over the world. There are about 25 known extinct species. Murex is solely an Indo-Pacific genus, as demonstrated by Ponder & Vokes (1988). The species from the western Atlantic that were formerly considered to belong in the genus Murex are now placed in the genus Haustellum. Most Murex species live in the intertidal or shallow subtidal zone, among rocks and corals. This genus includes many showy members, their elongate shells highly sculptured with spines or fronds. The inner surfaces of their ornate shells are often brightly colored. Costly and labor-intensive dyes Tyrian purple (or royal purple) and Tekhelet were historically made by the ancient Phoenicians using mucus from the hypobranchial gland of two species commonly referred to as "murex", Murex brandaris and Murex trunculus, which are the older names for Haustellum brandaris (Bolinus brandaris) and Hexaplex trunculus (Phyllonatus trunculus). This dye is a rare animal-produced organobromine compound, which the snails make using a specific bromoperoxidase enzyme that operates on dissolved bromide in sea water. This dye was used in royal robes, other kinds of special ceremonial or ritual garments, or garments indicating high rank. It is hypothesised that the dye was the same dye as that which featured prominently in the ancient Temple in Jerusalem, the clothing of the High Priest (or Kohen Gadol) officiating there; it is sometimes still used by Jews today in the ritual fringes (tzitzit) on four-cornered garments. A consensus has yet to be reached regarding the Biblical source of the "blue" dye. The genus Murex, as originally defined by Linnaeus, encompassed many taxa that are now placed elsewhere in the superfamily Muricoidea. During the 19th century, the definition of Murex was restricted by Lamarck and his contemporaries first to species in the family Muricidae, and then was limited even further to the subfamilies Muricinae and Ocenebrinae. Malacologists of the 19th century including Kiener, Reeve, Küster & Kobelt and Sowerby treated all muricoid forms as belonging to Murex. This is the main reason why Murex has so many synonyms. The World Register of Marine Species (WoRMS), lists the following species and subspecies with accepted names within the genus Murex. ^ Jannun R., Nuwayhid N. and Coe E. (1981) Biological bromination – bromoperoxidase activity in the Murex sea-snail. FASEB. J. 40, 1774. ^ Murex acanthostephes Watson, 1883. Retrieved through: World Register of Marine Species on 25 April 2010. ^ Murex africanus Ponder & Vokes, 1988. Retrieved through: World Register of Marine Species on 25 April 2010. ^ Murex altispira Ponder & Vokes, 1988. Retrieved through: World Register of Marine Species on 25 April 2010. ^ Murex balkeanus Vokes, 1967. Retrieved through: World Register of Marine Species on 25 April 2010. ^ Murex buccinatus Voigt, 1834. Retrieved through: World Register of Marine Species on 25 April 2010. ^ Murex concinnus Reeve, 1845. Retrieved through: World Register of Marine Species on 25 April 2010. ^ Murex hystricosus Houart & Dharma, 2001. Retrieved through: World Register of Marine Species on 25 April 2010. ^ Murex megapex Neubert, 1998. Retrieved through: World Register of Marine Species on 25 April 2010. ^ Murex ornamentalis Ponder & Vokes, 1988. Retrieved through: World Register of Marine Species on 25 April 2010. ^ Murex philippinensis Parth, 1994. Retrieved through: World Register of Marine Species on 25 April 2010. ^ Murex salomonensis Parth, 1994. Retrieved through: World Register of Marine Species on 25 April 2010. ^ Murex somalicus Parth, 1990. Retrieved through: World Register of Marine Species on 25 April 2010. ^ Murex surinamensis Okutani, 1982. Retrieved through: World Register of Marine Species on 25 April 2010. ^ Murex troscheli Lischke, 1868. Retrieved through: World Register of Marine Species on 25 April 2010. ^ Murex carbonnieri (Jousseaume, 1881). Retrieved through: World Register of Marine Species on 25 April 2010. ^ Murex coppingeri E. A. Smith, 1884. Retrieved through: World Register of Marine Species on 25 April 2010. ^ Murex falsitribulus Ponder & Vokes, 1988. Retrieved through: World Register of Marine Species on 25 April 2010. ^ Murex forskoehli Röding, 1798. Retrieved through: World Register of Marine Species on 25 April 2010. ^ Murex kerslakae Ponder & Vokes, 1988. Retrieved through: World Register of Marine Species on 25 April 2010. ^ Murex occa Sowerby, 1834. Retrieved through: World Register of Marine Species on 25 April 2010. ^ Murex pecten Lightfoot, 1786. Retrieved through: World Register of Marine Species on 25 April 2010. ^ Murex queenslandicus Ponder & Vokes, 1988. Retrieved through: World Register of Marine Species on 25 April 2010. ^ Murex scolopax Dillwyn, 1817. Retrieved through: World Register of Marine Species on 25 April 2010. ^ Murex spectabilis Ponder & Vokes, 1988. Retrieved through: World Register of Marine Species on 25 April 2010. ^ Murex spicatus Ponder & Vokes, 1988. Retrieved through: World Register of Marine Species on 25 April 2010. ^ Murex tenuirostrum Lamarck, 1822. Retrieved through: World Register of Marine Species on 25 April 2010. ^ Murex ternispina Lamarck, 1822. Retrieved through: World Register of Marine Species on 25 April 2010. ^ Murex trapa Roding, 1798. Retrieved through: World Register of Marine Species on 25 April 2010. ^ Murex tribulus Linnaeus, 1758. Retrieved through: World Register of Marine Species on 25 April 2010. ^ Murex antelmei Viader, 1938. Retrieved through: World Register of Marine Species on 25 April 2010. ^ Murex protocrassus Houart, 1990. Retrieved through: World Register of Marine Species on 25 April 2010. ^ Murex aedonius Watson, 1896. Retrieved through: World Register of Marine Species on 25 April 2010. ^ Murex argo Clench & Farfante, 1945. Retrieved through: World Register of Marine Species on 25 April 2010. ^ Murex edwardsi . Retrieved through: World Register of Marine Species on 25 April 2010. ^ Murex gubbi Reeve, 1849. Retrieved through: World Register of Marine Species on 25 April 2010. ^ Murex intertextus Helbling, 1779. Retrieved through: World Register of Marine Species on 25 April 2010. ^ Murex maroccensis Gmelin, 1791. Retrieved through: World Register of Marine Species on 25 April 2010. ^ Murex monodon Sowerby, 1841. Retrieved through: World Register of Marine Species on 25 April 2010. ^ Murex nassa Gmelin, 1791. Retrieved through: World Register of Marine Species on 25 April 2010. ^ Murex peritus Hinds, 1844a. Retrieved through: World Register of Marine Species on 25 April 2010. ^ Murex purpuroides Dunker. Retrieved through: World Register of Marine Species on 25 April 2010. ^ Murex recurvirostris . Retrieved through: World Register of Marine Species on 25 April 2010. ^ Murex rota Sowerby. Retrieved through: World Register of Marine Species on 25 April 2010. ^ Murex rubidus . Retrieved through: World Register of Marine Species on 25 April 2010. ^ Murex textilis Gabb, 1873. Retrieved through: World Register of Marine Species on 25 April 2010. ^ Murex triqueter . Retrieved through: World Register of Marine Species on 25 April 2010. ^ Murex tulipa Linnaeus, 1758. Retrieved through: World Register of Marine Species on 25 April 2010. ^ Murex vittatus Broderip, 1833. Retrieved through: World Register of Marine Species on 25 April 2010. Merle, D., Garrigues, B. & Pointier, J.-P. 2011. Fossil and Recent Muricidae of the World, Part Muricinae. 648 pp., 182 colour plates, Hackenheim. ISBN 978-3-939767-32-9. Ponder, W.F. & E.H. Vokes. 1988. A revision of the Indo-West Pacific fossil and Recent species of Murex s.s. and Haustellum (Mollusca: Gastropoda: Muricidae). Records of the Australian Museum, Supplement 8. 160 pp. 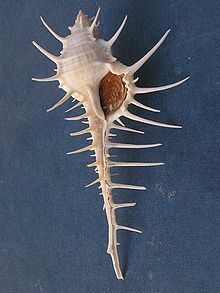 Wikimedia Commons has media related to Murex.